Last Intro to Civic Media class, we discussed the value of our cultural labor that we do for free and we created models to calculate that value. After all, there is a whole industry and field of research centered on how to make the most money possible by selling everything about a website’s users, even those who are only consuming content. I soon realized that it would be impossible to calculate the value of all my cultural labor because there are far too many considerations to include across too many companies. 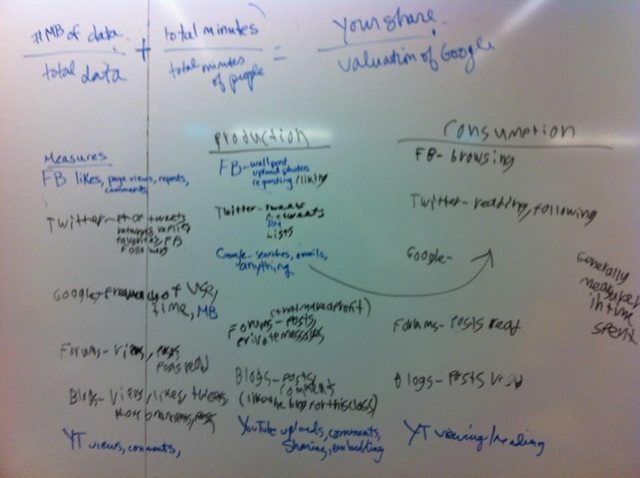 Thus, my group decided to focus on our value to one company, Google. How much is any given user worth to Google? Some people have tried to calculate this. Backupify claims the average gmail account is worth $3588.85 based on how long it would take someone to duplicate their own emails while being paid the average American salary of $45230 a year to do so. This metric seems incomplete as emails are measured in amount of data rather than how long they took to compose. According to backupify, my gmail account is worth $211.53 but I also have not stored my sent mail on gmail for a long time. Privacyfix calculates how much Google makes off you in ads based on your privacy settings and usage patterns over the last sixty days. It also calculates this for Facebook and websites in general. I am not sure what the average is, but Privacyfix says Google makes $0.74 a year from ads at my level of activity. Privacyfix also helps you limit what data Google, Facebook, and other websites can get from you. The problem with Google is that it has way too much information. Google services are distinct and use different methods to make money from users. Some, like Google Chrome, do not make any money from users directly. Others, like Google Docs, rely on subscribers to earn money. Finally, many Google services, like search, gmail, and maps, use ads to make money from users by selectively selling audiences. Companies have made money by selling audiences for many years. But today, companies can not only sell audiences but they can also target ads to specific people based on knowledge of their preferences. How much more are targeted ads worth? And what amount of data on a user maximizes the ability of Google to target ads? Once these questions are answered, we can get a rough estimate of Google’s ad revenue from any user. It is also worth noting that you can opt out of targeted ads on Google and block specific advertisers. However, Google says that those who are opted in see 1% fewer ads than those who are opted out. It also says that those who are opted in are 30% more likely to click ads. So for a rough estimate, I guess we could say that adds are 30% more valuable on average if they are targeted. If you are opted in, you can also see what data Google has on you and check if it is accurate. Now, how much is an ad worth? Or how much is a visitor worth? As for ad worth, it depends on the search term, where it is listed, etc. For the worth of a visitor to a website from an ad, it also depends on numerous factors, but mostly how much a website makes from visitors that first found the website through Google ads (total, not just money from a user’s first visit) divided by the number of unique users who visit from Google ads. This is impossible to calculate for every ad someone clicks. Plus, there is also some value from a user just seeing an ad and not clicking it as at the very least they might recognize the site in the future if they see it again. According to the table here, the average cost per click in 2011 was $1.04 and users clicked the links 0.4% of the time. So to get the average worth per ad seen, multiply $1.04 by 0.4% to get $0.00416 per ad on average. Now, I said above that targeted ads were most likely worth 30% more than untargeted ads. Most of the people using Google probably have targeted ads so the average value of untargeted ads is around $0.0032. These numbers are not accurate as even in this specific area there is a lot of other information needed to calculate an accurate value. Still, this provides a very rough estimate. The next step would be to count how many Google ads you see. This number depends on your usage and is not available anywhere currently. However, it could be obtained easily by using a browser addon to track it. Of course, if you are using a browser addon to track how many ads you see you might as well track how many you click. If you used a web camera for gaze tracking, you could even count how long you looked at any ad even if you didn’t click it. For the sake of this over-simplified formula, I will just say to multiply the appropriate number from the paragraph above by the number of ads you see per day of active Google use (or some other period of time) and then multiply that by the number of days you have used Google (or however long you want to extrapolate it to). The formula described above is just to get an extremely rough estimate of what Google makes off of you in ads (targeted or untargeted). Google still has a lot of other data about you and it uses it for much more than just targeting ads. It can use it to track bugs, give or sell anonymized data away, combine data across your accounts, etc. Each of these activities has a different value to Google and there is little information available on the value of each of these activities. A more complete formula would somehow value these activities, determine how much of your data was used for each, multiply those numbers together for each activity, and add them together for all money-making uses of your data. This also requires a complete list of everything Google does with its users data. Some users might have paid Google more for its subscription based services or other reasons. Those users should also add this amount to their total worth to Google. This is not labor they do for Google but it adds to their value. Google also hosts some data for you at their expense. How much data does Google host for you? Google Takeout lets you download your data from some Google services but not all of them. At the very least, you should probably add the amount of data in your Gmail account and Google docs to the total data downloaded from Google Takeout. According to Wikipedia, it costs $0.035 to store 1 GB of data in 2011. This cost depends on the price of the specific drives Google has and how long your data has been on them so it is not exact. To get your final worth to Google, subtract amount of data multiplied by the cost of storage from the total money Google gains from you. This is just a preliminary overview of how you can start to calculate your worth to Google based on the time you spend and your activities. The best way to actually calculate your worth with some vague accuracy would be to write an addon that automates much of this process and considers all known data on how Google uses your information. Even then, it would not be entirely accurate but it would likely give you a good idea of how you stack up compared to other users.